I made a bunch of SourceMod plugins. To use them, you first need to install Metamod and SourceMod. All feedback and suggestions are highly appreciated. I made a bunch of SourceMod plugins. To use them, you first need to install [url=http://wiki.alliedmods.net/Installing_Metamod:Source]Metamod[/url] and [url=http://wiki.alliedmods.net/Installing_SourceMod]SourceMod[/url]. Saw this in action for one of the casts. Was absolutely amazing. Can't wait to put it in, and thank you for releasing it. Thank you very much for releasing this plugin. Quick question, if you have a server with just TFTrue on it, do you need to install SupStats+SupStats-Extra if you want that functionality? OMG I love you F2. Been waiting for one of these for so long. Thanks so much F2. Can we see some real match stats examples? Stochast1cQuick question, if you have a server with just TFTrue on it, do you need to install SupStats+SupStats-Extra if you want that functionality? - If you want MedicStats, all you need to install is the MedicStats plugin. - If you want MedicStats and real damage, you need to install MedicStats + SupStats-Extra + LogsTF plugins, and in server.cfg you need to set logstf_apikey to your Logs.TF API key, and NOT set tftrue_logs_apikey. KAMOCan we see some real match stats examples? In collaboration with zoob from logs.tf, I have made a new plugin that logs new interesting stats. This plugin replaces supstats and supstats-extra, so remember to remove those from your server (otherwise the stats will be completely wrong). On logs.tf you can see an example of the new stats. In collaboration with zoob from logs.tf, I have made a new plugin that logs new interesting stats. [b]This plugin replaces supstats and supstats-extra, so remember to remove those from your server[/b] (otherwise the stats will be completely wrong). On logs.tf you can see an [url=http://logs.tf/149538]example[/url] of the new stats. 17 <Error> "MGEMod" (2.0.9) by Lange & Cprice; based on kAmmomod by Krolus. MGEMod: Map not supported. MGEMod disabled. That does seem weird. Here's some wild suggestions you can try. This all looks insanely good, and is very exciting. As a caster, I am especially glad to see the Wait for STV plugin. No more live casts being cut off by map changes! 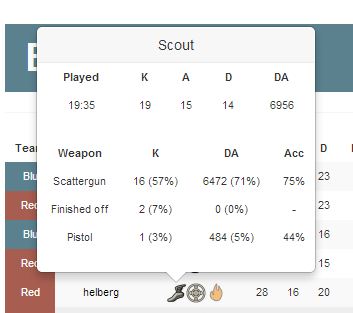 With the new version of supstats2, you can now see your accuracy for each of your weapons. Check out this sample log. Hover over each of the class icons to see the accuracies. Accuracies are computed based on shots fired vs shots hit. Building uber, rocket jumping and clearing stickies (with hitscan weapons) does not affect the accuracy. So far the following weapons are supported: Shotgun, Scattergun, Pistol, Rocket Launchers, Grenade Launcher, Sniper Rifle, SMG and Needles. Check out this [url=http://logs.tf/154545]sample log[/url]. Hover over each of the class icons to see the accuracies. Any ideas on how to work sticky accuracy in yet? DavidTheWinAny ideas on how to work sticky accuracy in yet? 1) You place 8 stickies, detonate them. If two of them hits, it counts as 1 fired, 1 hit. 2) You place 8 stickies, detonate them. If two of them hits, it counts as 8 fired and 2 hits. But I'm not fully convinced that sticky accuracy makes sense to look at. I mean, it's stickies! I just tried these out, they are great. I hope they become the standard! TheNomadI just tried these out, they are great. I hope they become the standard! I'm having an issue with the logs. The damage seems to be way off and that's it. All the other stuff like kills, deaths heals, and whatnot seems to be just right but the damage looks super wonky. I compared it to a sizzlingstats to make sure. It looks like it counts the damage as double. I also upgraded sourcemod and that didn't seem to fix it. raxozelletIt looks like it counts the damage as double. How likely would it be to add support for more pyro stats. I would like to be able to see how many reflects for damage the pyro did and how many players they extinguished. Right now looking at logs pulled from logs.tf/json/xxxxxx I can get pyro reflect kills and total reflect damage and thats about it. I'm displaying some class specific stats on my teams website, but pyro gets no love in the logs. Right now it's just AVG spy kills+assists per game and reflect kills, which makes for a pretty sorry table. Would love to have extinguishes and reflects for damage. BigMoneyPussHow likely would it be to add support for more pyro stats. I would like to be able to see how many reflects for damage the pyro did and how many players they extinguished. Right now looking at logs pulled from logs.tf/json/xxxxxx I can get pyro reflect kills and total reflect damage and thats about it. Actually, you can get that information from the logs. [quote=BigMoneyPuss]How likely would it be to add support for more pyro stats. I would like to be able to see how many reflects for damage the pyro did and how many players they extinguished. Right now looking at logs pulled from logs.tf/json/xxxxxx I can get pyro reflect kills and total reflect damage and thats about it. I'm curious, how are the headshots recognized? Are they crits that deal 150-450 as a sniper, or how does it work? RakeI'm curious, how are the headshots recognized? Are they crits that deal 150-450 as a sniper, or how does it work? All damage you do have a "flag" saying whether or not it was a headshot. So the "headshots" on logs.tf should be 100% precise. Well that's significantly more accurate than what I assumed, thanks for the quick answer. How are airshots counted? Any not necessarily deadly airhit above a certain distance off ground? Ash_How are airshots counted? Any not necessarily deadly airhit above a certain distance off ground? That also means that if the target is ubered, it still counts as an airshot. Just wanted to say thanks for these plugins!